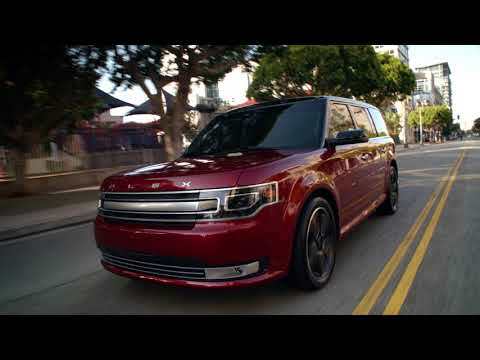 The Ford Flex is a full-size crossover SUV that's a more stylish approach to family haulers than the average three-row crossover. For some that may be a turn off, but the Flex has its fans thanks to its usable space and up to eight seating positions. Introduced for the 2009 model year, the Flex has seen few significant changes since 2013, when it received a new front end and a restyled dash. The 2019 Flex is mostly unchanged from the prior year's version. 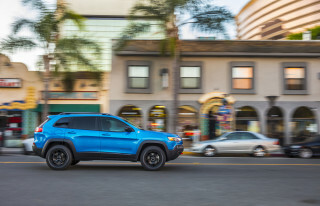 While the Flex overlaps with the more popular and rugged-looking Explorer seven-seat crossover, it's as much of a style statement as a predictable family vehicle. That said, its cavernous interior and class-leading infotainment features are ideally suited to family duties. The Flex has all along been a better seller in California than in the rest of the country, perhaps because that audience appreciates its post-modern station wagon looks, or because buyers there want most of the utility of a minivan without the stodgy look. When optioned with the white roof, this full-size crossover looks like a combination of a Range Rover and a Mini Cooper—you’d be hard-pressed to say about any other model on the market. Is it a witty counter-take on today's mainstream, or the ready descendant to the Country Squires and Fairlane wagons of the past? We'll let you decide; but there's no doubt it's a very fashionable piece, and different. The Flex was previewed by the Ford Fairlane concept of 2005, and the production version first appeared at the 2007 New York Auto Show. 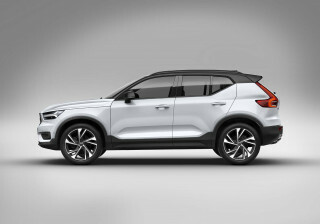 The slab-sided design includes horizontal strakes in the door panels that were inspired by vintage vacuum cleaners, according to designer Richard Gresens. Lots of chrome trim and the distinctive white roof give it a flair all its own, while the cabin is one of Ford's better efforts in recent history. Wood and metallic trim are comfortably integrated with leather or tweedy cloth seats, along with blue-lit gauges and cupholders and footwells with LED accent lighting. Ford offers a choice of two V-6 engines in the Flex. 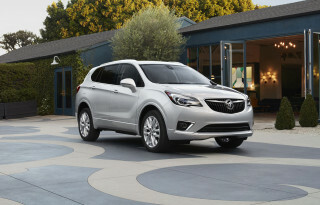 The base powertrain is a 287-horsepower, 3.5-liter with standard front-wheel drive and available all-wheel drive. 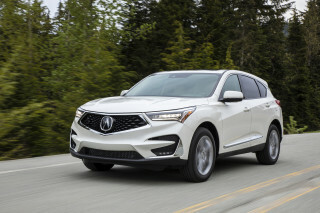 The optional engine, added in 2010, is one from Ford's EcoBoost line, a twin-turbocharged 3.5-liter making 365 hp; it's paired exclusively with all-wheel drive. Fuel economy is pretty good with all Flex models; the EcoBoost model is the most thirsty at 16 mpg city, 22 highway, 18 combined. The Flex's running gear originated with former corporate cousin Volvo. The "D4" platform shared by the Flex and the Lincoln MKT (as well as the latest Ford Taurus and Lincoln MKS) stems from the full-size chassis underpinning the former Ford Freestyle and Ford Five Hundred, which were in turn derived from the Volvo S80 and XC90. The chassis features fully independent suspension at all four corners with very well-damped ride motions and surprisingly responsive steering. The Flex can seat up to seven people, giving it acceptable minivan-alternative status. While the front seats are wide and nicely cushioned, their active headrests can push the head further forward than is comfortable—this is common among the company's products. Ford added a telescoping steering column for 2010, correcting the Flex's only real packaging-related problem. The crossover wagon's second row is one of the best-designed we've seen, with chairs situated up high and a choice of a bench or buckets that fold easily. The third row isn't too tough for adults to access, nor is it inhospitable for them. The last row can also be optioned with power folding to make reconfiguration a bit easier. All Flex models include three rows of seating and a good complement of standard equipment. Options include Ford’s Sync 3 infotainment system, navigation, a refrigerator between second-row seats, second-row footrests, a 12-speaker Sony audio system with Sirius Travel Link, and a glorious four-panel Vista Roof that opens up the Flex’s cabin to the sky. A dual-headrest DVD entertainment system is also available. Prices start at about $30,000, but with options and the EcoBoost engine, it's easy to push the pricetag well over $50,000. In 2013, there were some significant changes to the Flex. In that year, the Flex received more substantial updates to its powertrain, interior, and MyFord Touch infotainment system. A new instrument panel, steering wheel, seat trim and padding, and new finish panels were fitted, as was a slightly redesigned front end that rounds out the Flex's look—and looks like a USB port to some. 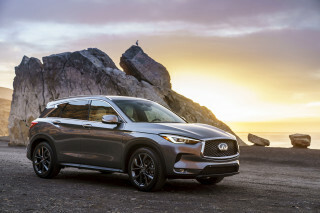 Other upgrades include a new thumb-shift manual control for the automatic transmission, along with optional rain-sensing wipers and power-folding mirrors; passive entry and start; a new range of wheel options, including 20-inchers; and dual chrome exhaust tips. Power and gas-mileage ratings changed slightly. The 2015 model year brought with it only minor feature changes and some additions to the Flex's color palette, but for the 2016 model year Ford replaced the unloved MyFord Touch interface with SYNC3, which is driven by entirely new programming, has a completely new interface and underlying technology, and in our experience, is much more reliable and simple to navigate. It also features Apple CarPlay and Android Auto compatibility. Ford carried over the 2016 model into 2017, 2018, and 2019 without any significant changes. 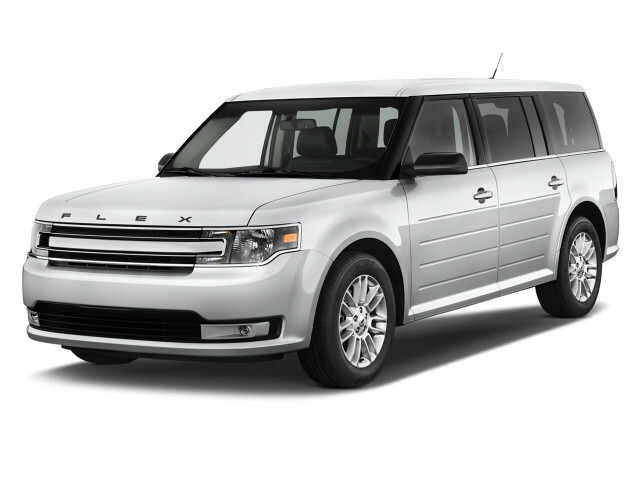 The Flex is built in Oakville, Ontario, next to the mechanically similar Lincoln MKT crossover. Expensive but enjoyable .With Ecoboost , Power , handling ,comfort better than avrage in class . One only negative point ...... 20'' Goodyear give a harder ride on bad road ,6 flat tires in 55,000 KM Expensive but enjoyable .With Ecoboost , Power , handling ,comfort better than avrage in class . Best riding most quiet car that I have ever owned. Our Flex is the best driving, most comfortable, and most quiet vehicle that I have ever ridden in. Our Flex is an excellent road car--room and comfort are super. The vehicle is very quiet.